There’s a good project for a grad student. Pump all the “dump laws” sites wording into some software and see if you can figure out what the original source is. It probably all goes back to a single forwarded email or FAQ. I meant “dumb laws” sites. I am kidding about Canada. All of you fine people in the Great White North calm down. There used to be a tradition at PSNS shipyard that the qualifying Docking Officer had to bring peanuts in the shell for the docking crew, 50 to 100 people depending on the size of the vessel, to be eaten during the docking evolution. It made quite a mess and several of the senior supervisors banded together to have the tradition abolished in the mid-1990s. 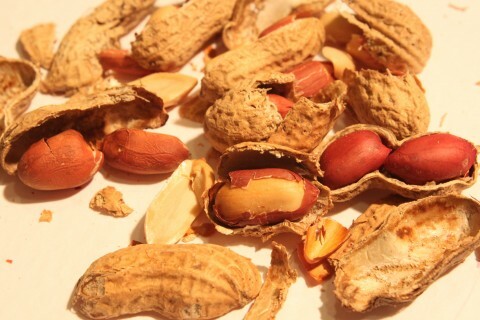 They made it “illegal” for the docking crew to eat peanuts in the shell during docking operations at the shipyard. Could that be the source of this rumor? Jerry — it is possible. Thanks for bringing that theory to our attention! I wonder if it’s an old law that got repealed. The only thing that I could think of is that maybe in the early days of Bremerton, when there were more horses on the streets, the discarded shells were too much of a temptation for the ponies to nibble on. Might have caused backup/delays? Maybe intestinal problems creating more of a mess? Might have got repealed when automobiles took over. 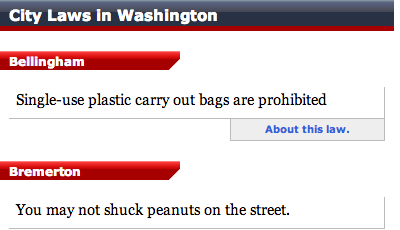 What If I was to get busted shuckin peanuts by a Redflex Camera? Could Bremerton use that video to prove my guilt? What if the peanuts were being shucked out the window and I was not the driver or the passenger? Would I still be responsible for the infraction? What if I contested the infraction in Judge Docter’s court and he used a unsworn, unqualified, un appointed robe wearing “judge” to determine my guilt? Would the judge be considered DE Facto? Would Mark Koontz claim it was all done “under the color of law” ??? What if the ticket was signed and dated and served from Arizona when the RCW clearly states the ticket is to be served by the officer in person at the time of the infraction.? ??? What if I thought this wrong and the laws clearly backed up my stance? Could I appeal my ticket before an unbiased judge or would she give Koontz the benefit of the doubt and claim it was all on the up and up because it was done “under the color of a de facto law” ??? ?